LEEDS - Rural Community Action Ministry’s Board of Directors recently named Janice E. Daku, a Farmington resident, as its new executive director. 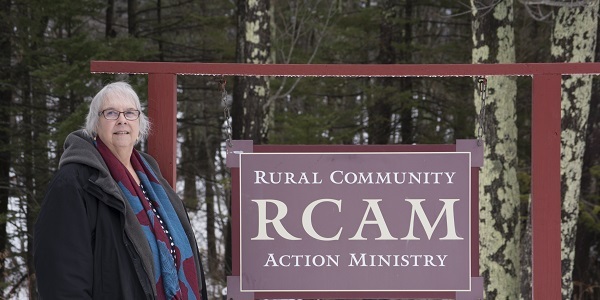 RCAM is a private nonprofit agency entering its 49th year providing services to vulnerable rural families, focusing primarily on 13 rural towns in central and western Maine. "The skill set, experience, success and passion that Janice brings as the new Executive Director is exactly what RCAM needs for its next chapter," said Geoff Miller, RCAM Board Chair. "Her experience with needs assessments and strategic planning are key as the Board and staff prepare for RCAMs future, and its 50th Anniversary in 2020." Daku has over 20 years of nonprofit management experience, much of which has been in a Community Action Agency environment. Daku was recently awarded Certified Community Action Professional Emerita, and is one of 12 commissioners on the national Community Action Partnership CCAP Commission. Her experience includes grant writing and fundraising; public speaking; staff training; marketing and public relations in both for-profits and non-profits; partnership and collaboration building; and legislative advocacy. "I feel blessed to have this opportunity to lead an organization that has been tirelessly meeting the needs of vulnerable people in rural Maine communities," said Daku. "I’m looking forward to building strong relationships and collaborations as RCAM moves forward." RCAM works with vulnerable people to help meet their needs for safe, adequate shelter, clothing, food and basic well-being in a way that maintains or improves their self-worth and dignity. RCAM is a United Way Member Agency. Executive Director Daku can be reached by phone at 207-524-5095 x. 208 and by email at janice@rcam.net. Congratulations Janice! Here is wishing you the best of luck! They are lucky to have you! Congratulations Janice! I wish you all the best in your new position as Executive Director of RCAM. RCAM is fortunate to have you just as they were fortunate to have Gil Ward for the last 10 years of his life.